long, long ago, when i was in high school, i had the pleasure of working at a craft fair that my mom’s friend organized. this isn’t your average church basement kind of thing- it’s a pull-out-all-the-stops, big budget type dealie. i did many jobs there, taking tickets, running errands, working for the vendors. 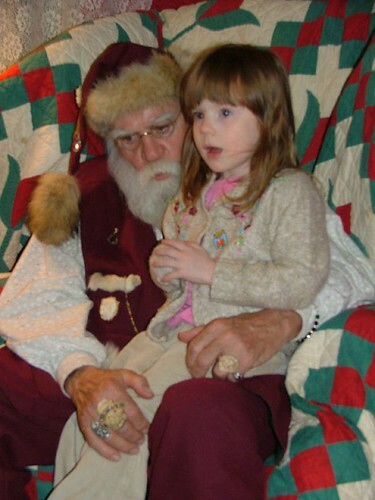 by far the best thing i got to do there was work with santa. the real santa. 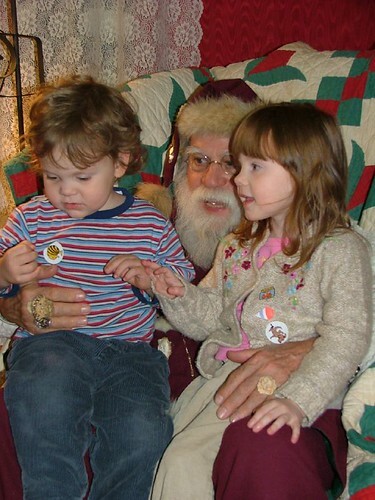 for years i dressed as an elf (no ears, sadly) and helped the kids standing in line to stay patient, and get their names to pass to santa in case he forgot them since last year. the real santa, in case you haven’t had the pleasure of meeting him, is a carver by trade, which comes in handy when working with the elves on a big deadline. you can recognize him by the carvings in his costume- all his buttons are cross sections of reindeer antler (dropped in the field, no reindeer were harmed in the making of this suit), carved into santa faces, his carved rings, his carved walking stick, his carved pocket knife (handy for knocking stones out of the reindeer hooves, as he explained to sage this year), and mostly, his demeanor. 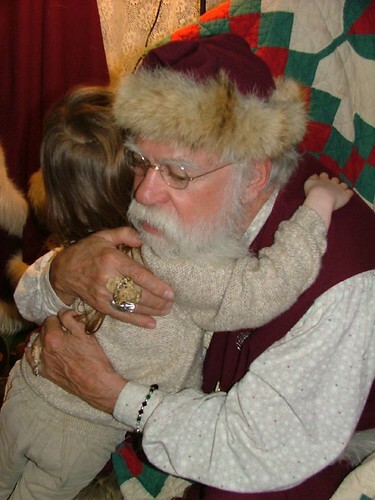 the real santa is loving and kind, soft spoken and genuine. he loves to talk about peace on earth and goodwill towards men more than playstation and pokemon. he cares deeply about every child and adult who visits him. he is a talented and creative artist. his personality is magnetic, and he lingers with people who need his time. truly, he is a saint. he made me cry this year, telling me how proud he was of the job i’ve done with my kids. sage told him she’d like some books with pictures and words this year, and we gave him a gift of some crocheted hearts to sew onto his stocking. he’s been giving me reindeer buttons to put on our stockings for years, so we thought that a fitting gift. i love him so much, and i wanted to share him with you. 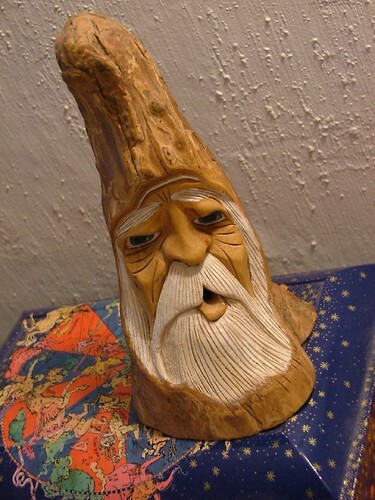 here is a carving he gave me many years ago, inscribed on the bottom, “to elf heather”. This entry was posted on December 6, 2006 at 12:18 pm and is filed under life in general, musings, super fun for little one. You can follow any responses to this entry through the RSS 2.0 feed. Both comments and pings are currently closed. Of course I almost cried while reading this… I can’t even handle how cute all of this information is and how warm it makes me feel inside. I just want to stare at a lit up Christmas tree and sing! haha.